While wandering the grounds of a Hindu temple in Kauai, I came across a garden on vividly colored succulents that stopped me in my tracks. The drama of the simple spiny leaves had heat, grace and foreboding. The swirling vortex of the extended petal reminded me of a Flamenco dancer's skirt. It became a candidate to paint for my new series of succulents that I spent 2018 working on for a November show in Anacortes, WA. See others in this Florascape section of my shop! This watercolor is painted on 300# Arches Cold Press paper. It is an original watercolor painting on a full sheet with deckle edge. 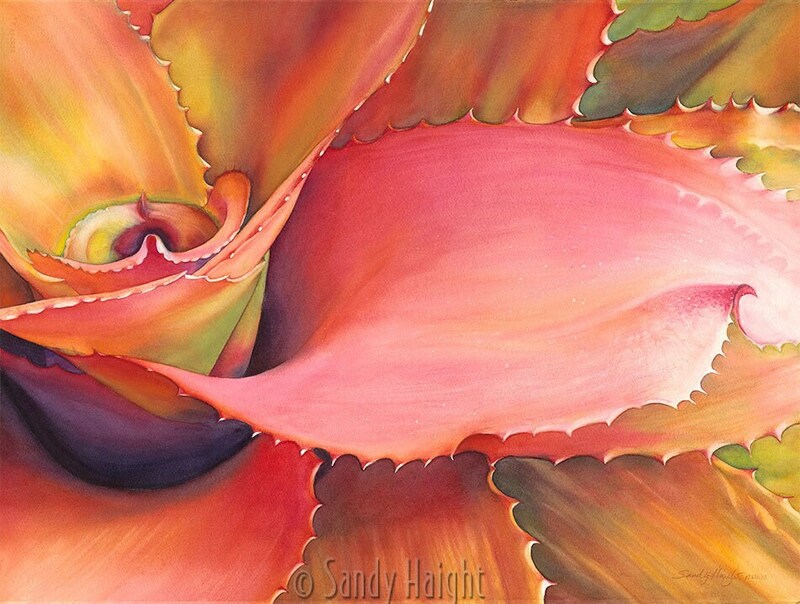 A Certificate of Authenticity comes with the watercolor signed by Sandy Haight. It is framed with a 1" contemporary white metal frame and archival white foam core backing floating the artwork without a mat to see the deckle edge of the paper.